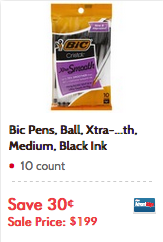 $0.49 Bic Pens 10 Pack At PC Thru 4/29! I can never seem to find any pens in my house, I'm going to grab a pack! Update: Or FREE at Target! I cant seem to get the coupon to print is it gone ?